Got a solid equipment shipping quote from our huge network of trucking companies. Done your background final check work on the shipping company you’ve choose. Made sure that your shipping insurance requirements properly met for your shipment. Preparing your shipment for transport is vital. Your equipment is almost ready to ship but you’re not done yet. Does your equipment need to be loaded onto the truck via crane or does it have wheels? If it has wheels don’t assume that the driver of the truck knows how to operate it. Make sure you have a equipment operator on site. Does your equipment have fuel in the tanks or other flammables that are required by law to be removed? Many states require that you completely empty to fuel tanks on tractors, dozers, etc. Some states require dozers exclusively be shipped with the blade detached. What’s your case? Can the height of your equipment be reduced to save you on shipping and transport costs? You will also want to make sure that you have created a lading bill for the driver of the equipment shipping company. You can ship anything over the road without a bill of lading. 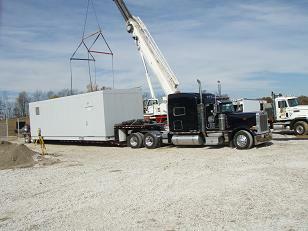 You will at some point be required by the equipment transport company to sign a transportation agreement. Make sure you read this document in its entirety and have them initial and re-send or fax you can copy of the revisions. They absolutely revise it as it’s their contract so don’t take “no” for an answer if you think you may be affected by it. Your having those thoughts for a reason. Make sure you are prepared to load your equipment that needs to be shipped. Remember if you delay a equipment shipping company beyond the amount of time specified on the transportation agreement you will be liable for truck detention time fees that are billed additionally. Being prepared means that you have done everything possible to prevent this. So, at the loading site make sure you have extra stuff. Make sure that if you are loading a dozer or loader or equipment with tires or tracks that you have discussed the issue of ramps with your shipper. Does the trailer have ramps? If not do you have ramps or a pile of dirt they can back up to that will serve as ramps? Do you have extra lumber to block with? A saw to cut lumber with? Duct tape, baling wire and anything else you can think of to account for the unaccountable? Odds are you’re going to need it. There’s nothing like being truly prepared, especially with equipment shipping.